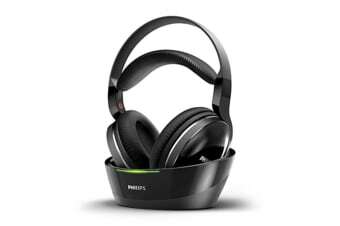 With the new 40mm speaker driver, the Philips Digital Wireless Headphones delivers exceptional crystal clear audio and wireless connectivity. The auto adjustable fit keeps your ears extremely comfortable whilst listening to music for hours and the charging dock supports easy, hassle free charge. The Hi-Res audio offers best-in class sound by reproducing the quality of original recordings. You can enjoy music/talk time for up to 20 hours with the Philips Digital Wireless Headphones.